What do “weeds” have to do with it? Even though it was ten years ago, I remember this event like it was yesterday. Shortly after receiving the keys to my very first home, I walked around the exterior of the house, grinning from ear to ear, quietly celebrating perhaps my biggest adult milestone to date. When I reached the back yard, however, my excitement quickly turned to dread. The yard wasn’t really a yard, but rather a compilation of any type of weed you could possibly imagine. Some were almost as tall as me. So, rather than letting my dread get the best of me, I did what any first time homeowner would do. I grabbed my trusty weed eater, which I had just purchased at the local Home Depot, and went to town. In less than an hour, my backyard was completely transformed. Or so it appeared. You see, the mistake I made is one that transcends weed eating. In an effort to achieve instant gratification, I chose to treat the symptom (weeds) instead of addressing the cause (roots of the weeds). What ensued were months and months of weed eating, only to see the same weeds appear in a matter of weeks. 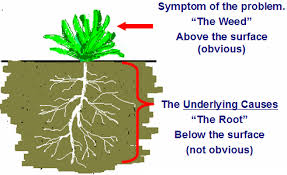 While treating the symptom is certainly a viable option, it’s not the most effective long-term strategy. Below is a common situation where it’s easy to fall into a “symptoms based” approach, along with an alternative solution that is geared toward addressing the cause. Situation: A child is misbehaving at home or in school. I’ll be the first to admit that it’s easy for parents and/or teachers to solve a behavior problem with a quick-fix approach, such as a timeout or a loss of privilege. While these punitive measures will likely address the obvious symptom (child’s behavior), the underlying cause (reason for child’s behavior) is often overlooked because it’s much more difficult to discern. The end result is that much like the weeds that continued to reappear in my backyard, the child’s behavior will most likely do the same. Alternative solution: Empower the child by addressing the cause of the behavior. What we often fail to recognize as parents and teachers is that behaviors are influenced by thoughts and feelings. Therefore, it’s important that we empower our children with emotional intelligence strategies, such as self-awareness and self-management. Instead of simply telling a child that what he/she did was wrong, we can empower them to reflect on the thoughts and feelings that led to a specific behavior. Here is a simple emotional intelligence strategy I teach that I encourage you to share with your child. It’s called MORE (Monitor Own Replace Empower) and it serves as a simple acronym to use in any situation. Below is a brief video where I explain how to implement the strategy. I love the MORE technique!